I saw this coming, did you? I knew that I was totally going to try GRAPE JAM in a new version of my raspberry coconut bars. 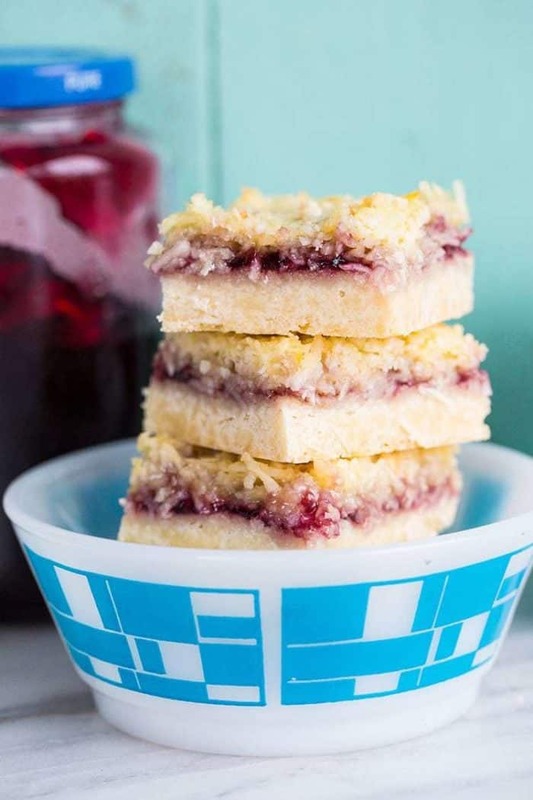 Grape Jam Coconut Bars. Heck to the YES! Why is grape jam ignored so much? It’s rarely the first to go in restaurants, everyone is always going for the raspberry or strawberry. It’s almost never used in bars or squares in desserts. Why the no love for grape jam? Let these squares be the one thing that has you buying a jar of grape jelly. You can use it for these squares and then enjoy it on your toast. That’s what we have been doing. I admit it, we ignore grape jam in my house as well. If I hadn’t actually had a hankering for these squares, I am ashamed to admit that I still wouldn’t have a jar of grape jam in the fridge. 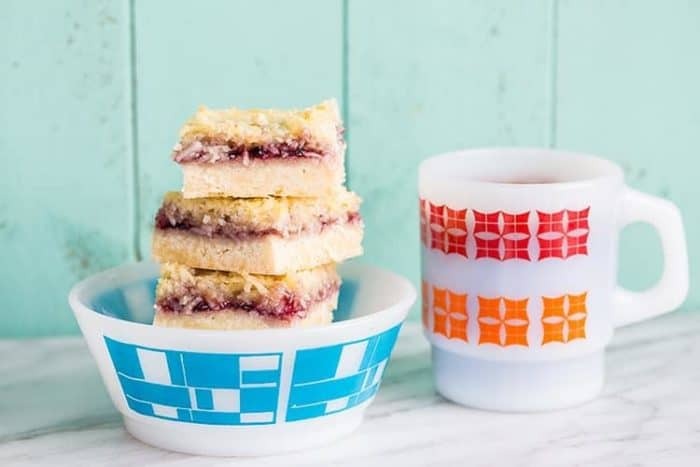 Now, these jam bars squares are seriously delicious. Bake them up, freeze them for company and enjoy them. They are such a NEW taste, does that make sense? New. No one really uses grape jam in bars, so these are an unexpected treat! The real question is, where do YOU stand on grape jelly? Is it something that is in your fridge on a regular basis or are you like me and will buy it for these bars and then enjoy it for a while…and forget it again? Bet you never thought that grape jam and coconut would taste THIS good together! 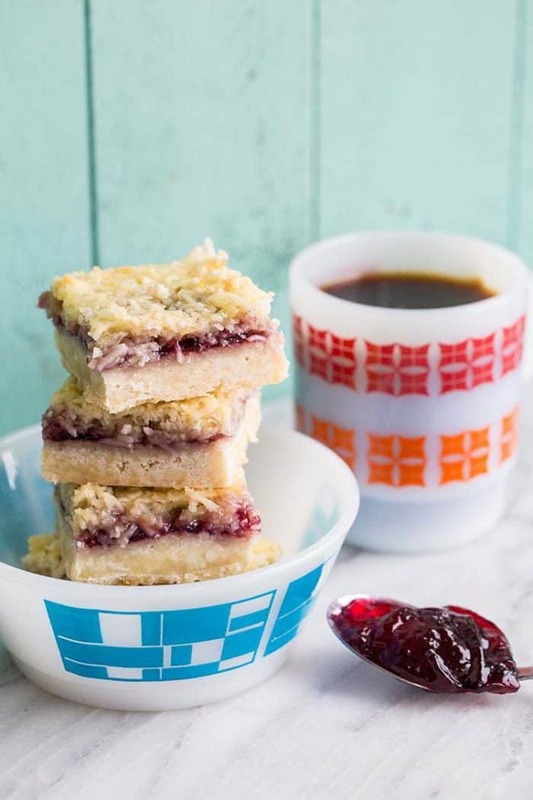 These jam bars are SO easy to make, it's deadly! Mix the flour and sugar together, then cut in the butter with a pastry cutter until crust mixture resembles crumbs. Pat the crust evenly into bottom of the baking dish. Bake the crust in the oven for 10-12 minutes until lightly browned. Remove and set aside. Spread the grape jam over the crust. Mix the topping ingredients together until there are no lumps and spread evenly over the top. Return to oven. Bake for 25-35 minutes or until the filling is firm and set. Cool, then slice and serve! These freeze exceptionally well. Definitely going to try these. Thanks! We always have grape jelly because it’s the only kind my grandson likes and he would starve if not for p.b. & j’s! Wonder what this would be like with a layer of peanut butter before the jam? Then the coconut as usual.. hmmm might have to try it.